The Australian Shepherd litter of Northbrooks Just Incredibelle has been born! There are 6 males and 2 females. 4 of them are Black Tri's and the other 4 are Blue Merle. There are3 males and 1 female of each colour. Hello, we are Trixie and Ian Wood of St. Catharines, Ontario. With this litter, we'll be first time "grandparents"! We have put a great deal of thought and care into the planning of Belle's first litter. 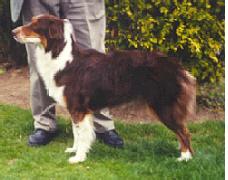 She is a two and half year old Red Tri. Her notables include agility and size in her genetic heritage. She is well-muscled and has a great side gait. 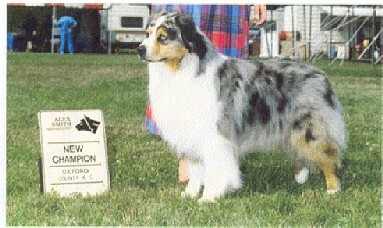 Kit is a Champion Blue Merle with lots of coat and bone and a good head and stop. Both have hips and eyes cleared. Because this is our first litter, we are doing things "by the book" to ensure that the puppies have a great start. The pups are due in early June. We invite you to contact us at lin189@niagara.com to inquire about the upcoming litter or to talk about the breed.